Many possibilities exist for the order in which to teach cursive letters. So the question becomes, how to decide? Should one teach small letters first, capital letters first, or a mixture of the two? Should letters be presented in the order of the alphabet, similar letters together, or those letters most-used to be learned first? I taught cursive for many years, and made a number of sets of masters with letters taught in different orders each time. After a great deal of experimentation, here are my conclusions. Teaching the small letters first, and capitals later (the most common system) often gives the result that many students never completely master the capitals. When this happens, students don’t ever feel completely confident with their cursive, and those students are the ones who are first to revert to printing in subsequent years. I’ve even had teachers (in their 20s and 30s) tell me that this happened to them as children, so they never felt confident with their cursive, and are embarrassed to write on the board with it. My recommendation is to teach similarly-formed small letters together. Teach the capitals of those same letters at the same time as the small letters, and give students immediate daily practice with these capitals. As my class masters just a few letters, I immediately make supplemental cursive masters with my students’ names on them. Students love learning to write the names of every student in the class with proper cursive capitals. My two priorities here were to get through the vowels as quickly as possible, in addition to grouping together similarly-formed small letters. Capitals for the same letters are added on the the worksheets at the same time. By the time I got to the last worksheet, there was only “z” left, which is why it is alone. I would suggest making a worksheet of numbers and punctuation FIRST, rather than putting it at the end. I just forgot to do it that way this time, which is why it is the last worksheet. 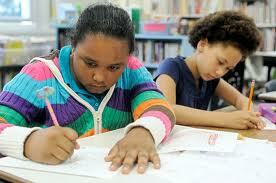 By including numbers, it’s easy to correct students’ writing of figures in math and on tests. By including punctuation, it helps to correct all the students who don’t have a clue where to start a comma on the line and pull downward, or the students who finish the top half of question marks and exclamation marks right down on the line, and place the period part actually below the line. Any grouping you choose, as a teacher, will be fine. Just know in your own mind why you are choosing it. For example, the vowel “o” might make more sense to follow Worksheet 1 (c, a, d) in terms of formation, but since “e” is more commonly used in words, I chose to go ahead with “e” and “l” in Worksheet 2. The next post will discuss which style of cursive writing to choose. 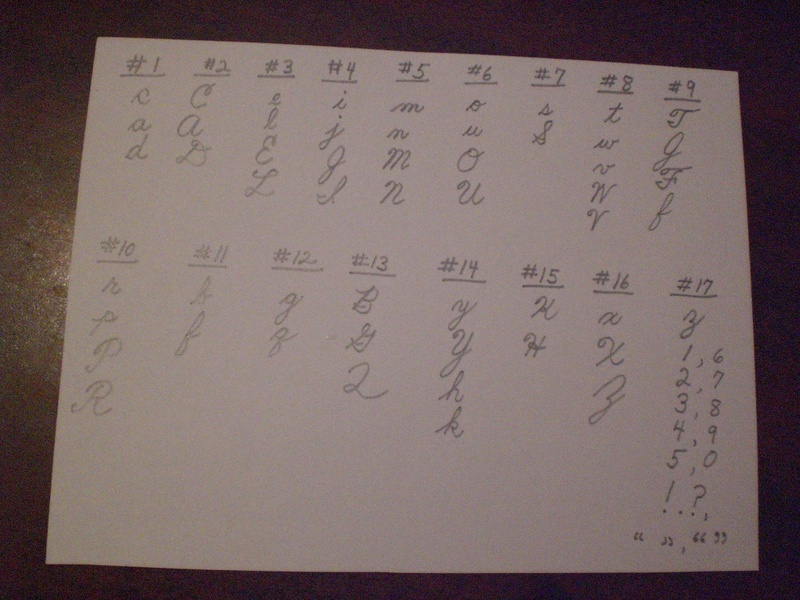 Part 5: Which Form of Cursive Should I Teach?